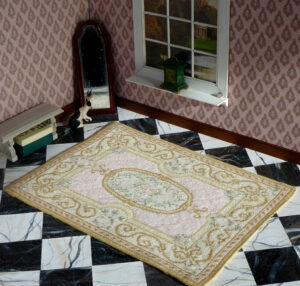 It’s been a long time coming, but here I am, announcing the release of the third of my antique French floral style mini carpets – Oakford Bridge. What I’m working on now: I’m enthusiastically stitching the next addition to BrightSea Village. It’s a building I visit frequently in real life – the library. What village would be complete without one? This entry was posted in Miniature Carpets & Rugs on September 9, 2017 by Elli Jenks.